In 1806, Londoner William Thornhill is sentenced to be deported to New South Wales for the crime of theft. Taking his wife Sal and their children with him, Will starts a new life on the banks of the Hawkesbury river. But this land is already home to a group of aborigines and soon tensions between the aborigines and the settlers start to appear.Kate Grenville is certainly a talented author. 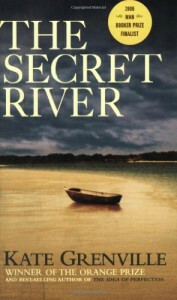 The Secret River is set in the slums of London, nineteenth century Sydney and the wilderness of the Hawkesbury river but all of these settings came across as remarkably vivid. I love historical fiction that is about 'ordinary' people rather than monarchy or nobility so I really enjoyed the opening section about Will and Sal's life in London. Born poor, Will tries to make his way honestly but ends up in a series of ever worsening damp slum houses and with children he can't afford to feed. London at that time in all it's grime and poverty is portrayed extremely well. Given his background, it's easy to see why Will becomes possessed with the desire to own his own land once he gains freedom in Australia. The Hawkesbury river seems like a paradise and listening to this book, I felt as though I was almost there.I thought the way Grenville wrote about the aborigines was very clever. Although the book is written from the point of view of Will, it's easy to see that the settlers are at a disadvantage in some ways from the start - they spend time cultivating the land when there is already food aplenty if only they would see it, they can't create and manage fire in the way the aborigines can, guns aren't as effective as spears in this environment. It's a real culture clash with the white settlers seeing the land as free because there aren't fences and farms all over it and the aborigines unable to comprehend the settlers and unsure at how they should react to them.I also appreciated that Grenville created some variation amoungst the settlers, with many different viewpoints considered. Some, like Smasher Sullivan, are repulsive examples of humanity, seeing the blacks as animals and others, like one of Will's boys and Blackwood find common cause and admire the aborigines. As events moved towards the conclusion, the book became gripping reading. The only criticism I would make is that after the dramtic event happened, the final section of the book seemed to lag, almost as if Grenville didn't know when to stop.A word on the narrator - at first I found Bill Wallis'gravelly voice hard to listen to, but as I got caught up in the story his voice seemed perfect for Will's viewpoint.